Knights of Creativity Spirit & Ale: The Bard or Not The Bard? LONDON (AP) — Scholars studying the life and times of William Shakespeare unveiled a portrait Monday believed to be the only authentic image of the Bard painted during his lifetime. Experts at the Shakespeare Birthplace Trust believe the painting was used as the basis for the enduring engraving of Shakespeare that graces the cover of the First Folio collection of his plays. Paul Edmondson, the group's director of learning, said it was also used as a basis for the famous portrait of the playwright that hangs in the Folger Shakespeare Library in Washington. "What makes it so important is that it's a portrait of William Shakespeare made during his lifetime," he said. "We think it was painted in 1610 and several copies of it were made early on, including the engraving. So our portrait is the primary version of one of the greatest portraits of Shakespeare." Edmondson said experts are confident that the handsome, bearded man in the portrait is the author of some of the most enduring words ever written in the English language. "We're 90 percent sure that it's Shakespeare," he said. "You'll never be entirely certain. There will always be voices of dissent." The disclosure was made on a bumper day for Shakespeare fans and devotees throughout the world: the Museum of London also announced that the foundations of the theater where Shakespeare's plays were performed, and where he himself performed as an actor, had been found in Hackney on the eastern outskirts of London. The Museum's archaeologists had also found a piece of pottery with an image of a man who resembles Shakespeare, said spokesman Tim Morley. "We are 99 percent certain this is the theater, it's in the right place and the brickwork is the right age," he said. Museum officials said the rudimentary playhouse, called The Theatre, was built in 1576 by James Burbage. The site, where Shakespeare performed from 1594 to 1597, now houses an abandoned warehouse. Experts believe Romeo and Juliet was performed there. Officials hope to build a small new theater on the site. 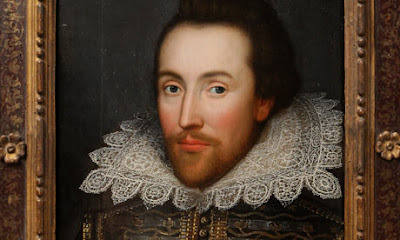 The newly identified portrait of Shakespeare is to be put on public display at the Shakespeare Birthplace Trust in Stratford-on-Avon from April 23 until Sept. 6. Yeah, I saw this story online earlier today. Great news for us, since we will be staying in Stratford Upon Avon in July. We'll get to see the handsome lad ourselves! Seems like they might have struck lucky this time.. as the owners the Cobbe family of Hampshire were good friends of who they believe was the original owner... the third Earl of Southampton, ( which is in Hampshire ) who was Shakespeare’s patron and, according to some, the “fair youth” of his sonnets. What kind of Patron was he?